Staff from the East Lansing Public Library and the Michigan State University Museumopens a new window have partnered to create an interactive StoryWalkopens a new window featuring the book Because of an Acorn by Lola Schaeferopens a new window. Our very own Miss Eva worked with MSU staff to find the perfect book for this unique exhibit. Children and adults can explore the book along with the natural exhibits at the museum through February 2019. "StoryWalks are a wonderful way of putting a fun, interactive twist on books for both children and caregivers, and we're so excited to partner with the MSU Museum on this project to help grow a love of science, reading and literacy for all sorts in the East Lansing community," said Eva Weihl, Children's Librarian at ELPL. “Collaborating with the ELPL on this project allowed us to see great new possibilities in our museum spaces. 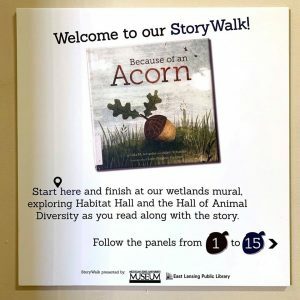 The StoryWalk panels draw visitors into the beauty of the story and then enrich connections with the highlighted animal specimens. We appreciate the ELPL’s willingness to explore with us how integrating children’s literature into exhibitions can enhance museum experiences,” said Denice Blair, MSU Museum Education Team, Co-Manager.